Osteonecrosis (see images below) of the humeral head is a disorder that involves osteocytes and marrow and is characterized by bone death. Osteonecrosis of the humeral head may be traumatic or atraumatic. Most of the information regarding osteonecrosis of the humeral head is extrapolated from the research findings on osteonecrosis of the hip, which has been studied more thoroughly and is therefore better understood than osteonecrosis of the shoulder. 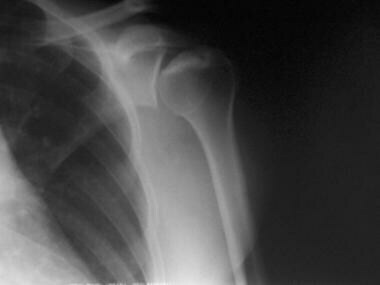 Shoulder osteonecrosis stage II disease. Shoulder osteonecrosis stage IV disease. Osteonecrosis of the humeral head ultimately can result in collapse of the humeral head articular surface and joint destruction. The shoulder is not subjected to the same weightbearing forces as the hip. The glenoid is less constrained and therefore accepts greater deformity of the humeral head. Also, the blood supply about the shoulder is abundant, and the scapula can compensate for some of the glenohumeral motion loss. Disease prevention is key. Identifying those at risk and defining preventive measures is helpful. Many cases can be treated successfully without surgical intervention. Prosthetic fixation in those with osteonecrosis of the shoulder often can be performed without cement because of good bone quality. Clinical identification of disease progression is critical to recognize and treat symptomatic disease in the early stages, thereby avoiding arthroplasty. The major blood supply to the humeral head is from the ascending branch of the anterior humeral circumflex artery, which enters the humeral head through the bicipital groove. The posterior humeral circumflex artery pierces the rotator cuff attachments and provides a small amount of collateral flow. Collateral flow about the proximal humerus is minimal, putting the head at risk through trauma or other circulatory insults. Glenoid involvement is believed to occur secondarily to deformity of the humeral head. Intraosseous blood supply to the head arises from the arcuate artery. The initiating insult appears to differ on the basis of causation. Traumatic disruption of the proximal humeral vasculature is a mechanical disruption. Several theories of steroid-induced disease exist. One proposed theory is that increased intraosseous fat cell size results in increased intraosseous pressure and fat embolism. Alcohol abuse appears to work in a manner similar to that of steroids. Caisson disease or dysbarism causes cell death via air bubbles, with resultant congestion and ischemia. Sickle cell disease causes infarcts in the subchondral bone via infarcts of diseased red blood cells. Following the initial insult, the pathogenesis of the disease is the same, despite etiology. Death of cells and marrow occurs. During the healing phase, bone resorption occurs to eliminate necrotic tissue. During this phase, the bone is weakened. Therefore, the forces across the subchondral plate of the weakened bone can result in microfractures and subsequent collapse. With progressive deformity of the humeral head, the glenoid becomes involved secondary to mechanical factors, with resultant arthritic changes. The incidence of both forms of osteonecrosis of the shoulder, particularly the atraumatic form, is difficult to determine. However, it appears to occur less often than in the hip. The traumatic form has been reported in up to 34% of 3-part fractures and 90% of 4-part fractures, as well as nearly all fractures of the anatomic neck. The traumatic form of shoulder osteonecrosis can occur at any age in the face of 3-part, 4-part, or anatomic neck humeral fractures and/or dislocations. The atraumatic form usually occurs in patients aged 20-60 years with appropriate risk factors. The shoulder joint bears less weight than the joints of the lower extremity; therefore, symptoms can be mild, even in those with advanced disease. Many patients obtain good results when conservatively treated with analgesics and/or physical therapy for extended periods of time. Surgery can be reserved for those with severe pain, as patients with early-stage disease often do not progress radiographically. Patel S, Colaco HB, Elvey ME, Lee MH. Post-traumatic osteonecrosis of the proximal humerus. Injury. 2015 Jun 19. [Medline]. El Gamal TA, El-Bakoury A, Hawkins A, Ed AlTayeb Mussa M, Er Ahmed Sweed T, Eh Samir Ansara S. Bilateral Osteonecrosis of the Femoral and Humeral Heads after Short Term Corticosteroid Therapy. A Case Study. Ortop Traumatol Rehabil. 2016 Mar 23. 18 (2):187-190. [Medline]. Cruess RL. Experience with steroid-induced avascular necrosis of the shoulder and etiologic considerations regarding osteonecrosis of the hip. Clin Orthop Relat Res. 1978 Jan-Feb. 86-93. [Medline]. Cruess RL. Steroid-induced avascular necrosis of the head of the humerus. Natural history and management. J Bone Joint Surg Br. 1976 Aug. 58(3):313-7. [Medline]. Cushner MA, Friedman RJ. Osteonecrosis of the Humeral Head. J Am Acad Orthop Surg. 1997 Nov. 5(6):339-346. [Medline]. Mont MA, Ulrich SD, Seyler TM, Smith JM, Marker DR, McGrath MS, et al. Bone scanning of limited value for diagnosis of symptomatic oligofocal and multifocal osteonecrosis. J Rheumatol. 2008 Aug. 35(8):1629-34. [Medline]. Sakai T, Sugano N, Nishii T, Hananouchi T, Yoshikawa H. Extent of osteonecrosis on MRI predicts humeral head collapse. Clin Orthop Relat Res. 2008 May. 466(5):1074-80. [Medline]. Ficat RP, Arlet J. Necrosis of the femoral head. Hungerford DS. Ischemia and necrosis of bone. Baltimore, MD: Williams & Wilkins; 1980. 171-82. Soohoo NF, Vyas S, Manunga J, Sharifi H, Kominski G, Lieberman JR. Cost-effectiveness analysis of core decompression. J Arthroplasty. 2006 Aug. 21(5):670-81. [Medline]. LaPorte DM, Mont MA, Mohan V, Pierre-Jacques H, Jones LC, Hungerford DS. Osteonecrosis of the humeral head treated by core decompression. Clin Orthop Relat Res. 1998 Oct. 254-60. [Medline]. Mont MA, Maar DC, Urquhart MW, Lennox D, Hungerford DS. Avascular necrosis of the humeral head treated by core decompression. A retrospective review. J Bone Joint Surg Br. 1993 Sep. 75(5):785-8. [Medline]. Harreld KL, Marulanda GA, Ulrich SD, Marker DR, Seyler TM, Mont MA. Small-diameter percutaneous decompression for osteonecrosis of the shoulder. Am J Orthop (Belle Mead NJ). 2009 Jul. 38 (7):348-54. [Medline]. Kawamura K, Kawate K, Yajima H, Kobata Y, Takakura Y. Vascularized scapular grafting for treatment of osteonecrosis of the humeral head. J Reconstr Microsurg. 2008 Nov. 24(8):559-64. [Medline]. Feeley BT, Fealy S, Dines DM, Warren RF, Craig EV. Hemiarthroplasty and total shoulder arthroplasty for avascular necrosis of the humeral head. J Shoulder Elbow Surg. 2008 Sep-Oct. 17(5):689-94. [Medline]. Smith RG, Sperling JW, Cofield RH, Hattrup SJ, Schleck CD. 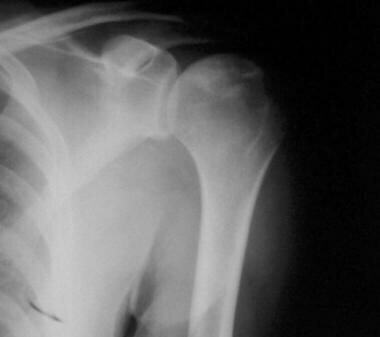 Shoulder hemiarthroplasty for steroid-associated osteonecrosis. J Shoulder Elbow Surg. 2008 Sep-Oct. 17(5):685-8. [Medline]. Tauber M, Karpik S, Matis N, Schwartz M, Resch H. Shoulder arthroplasty for traumatic avascular necrosis: predictors of outcome. Clin Orthop Relat Res. 2007 Dec. 465:208-14. [Medline]. Raissp,Kasten p, Baumann F, Moser M, Rickert M, Loew M. Treatment of osteonecrosis of the humeral head with cementless surface replacement arthroplasty. JBJS(Am). Feb 2009. 91(2):340-9. [Medline]. Uribe JW, Botto-van Bernden A. Partial humeral head resurfacing for osteonecrosis. J Shoulder Elbow Surg. Sept-Oct 2009. 18(5):711-6. [Medline]. Schoch BS, Barlow JD, Schleck C, Cofield RH, Sperling JW. Shoulder arthroplasty for atraumatic osteonecrosis of the humeral head. J Shoulder Elbow Surg. 2016 Feb. 25 (2):238-45. [Medline]. Schoch BS, Barlow JD, Schleck C, Cofield RH, Sperling JW. Shoulder arthroplasty for post-traumatic osteonecrosis of the humeral head. J Shoulder Elbow Surg. 2016 Mar. 25 (3):406-12. [Medline]. Shoulder hemiarthroplasty in a patient with shoulder osteonecrosis. Disclosure: Received research grant from: DJO surgical<br/>Consultant and receive royalties from DJO surgical. The authors and editors of Medscape Reference gratefully acknowledge the contributions of previous author Michael Mont, MD,to the development and writing of this article.